Don't forget about Trevor's Project Penguin craft challenge! You have until Sunday, January 3 to enter. We have some unusual Christmas traditions in the deRosier house. Probably the most strange is that we don't do Santa, elves, or anything else that takes credit from the person who actually made or purchased each gift. (Trevor always gets strange looks when people ask what Santa brought him and he says, "Nothing.") Another different-than-normal tradition is opening all our presents to each other on December 23. And, we handmake all our thank-you cards on the 22nd or the 23rd. 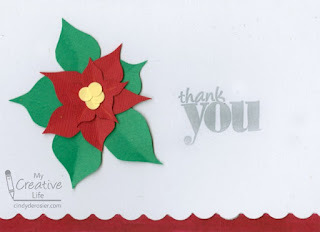 There are others, but today I want to talk about thank-you cards. I've relaxed my thank-you note policy as Trevor has aged. Until he was about 6, I had him make and write thank-you cards to absolutely everyone who gave him a gift. Now I only require that he mail thank-you cards to people who didn't see him open his gifts in person. Everyone else gets a heartfelt thank-you when he opens it, and often an emailed or phoned thank-you later when he's actually using the gift. Begin by drawing an ordinary star on the red paper. Make each of the five points into more of a teardrop shape as shown. Draw another star on red, smaller than the first. Make its points into teardrops too. Then make one larger star on the green cardstock. Cut out each star. Bend them slightly at each point to create some dimension. Punch some circles from the yellow cardstock. Glue the stars to the white cardstock, starting with the largest. Rotate each so that the points don't line up. Use the punch to add a scalloped border on the card front, then run the marker along the bottom inside of the card so that it shows from the front. Stamp the sentiment and it's ready to go. These thank-you cards give me the chance to say thank you to all of you who read my blog and support my creative endeavors. I am so grateful to you all. I'll be taking a week off from blogging, so I'll see you back late next week. Merry Christmas to all who celebrate! 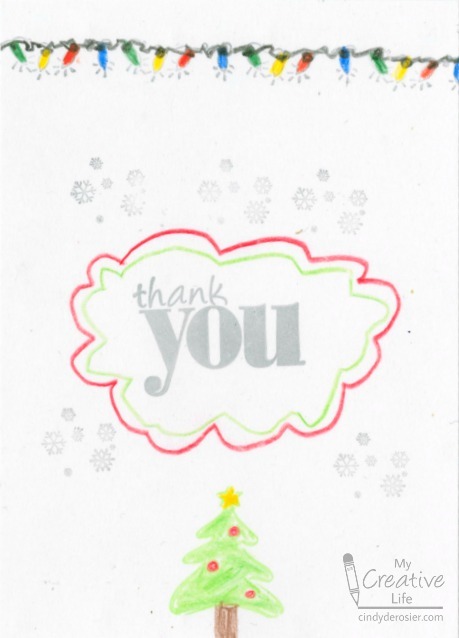 We also do thank you cards ... but to everyone .. but we have been busier than normal this season -- so I still have to make them! LOL! I loveeeeeeeee these!! So CLEVER the way you made that!!!!!!!!!!!!!!!!!!!!! Love these thank you cards! We had every intention to play along with your craft challenges - we have all of the ingredients, but just didn't get the chance!!! It's not too late! You still have 5 days!